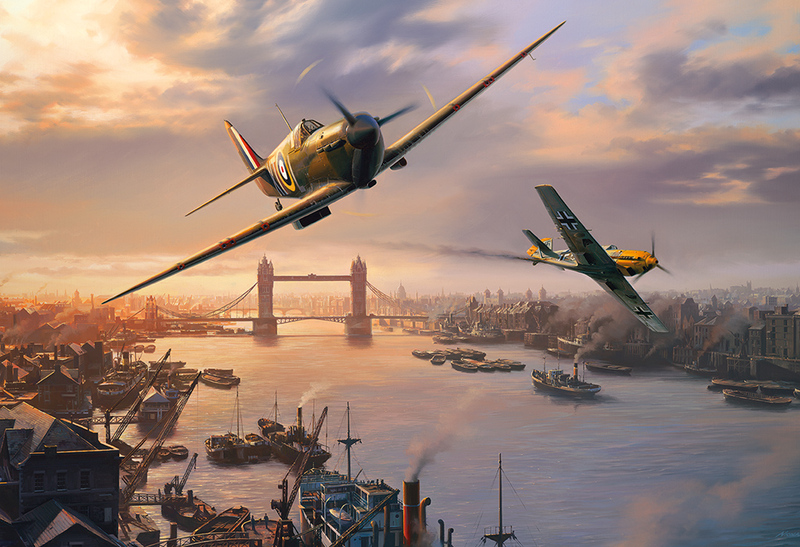 It’s 1940 and the Battle of Britain is full steam ahead as the Spitfire and Messerschmitt tussle above the Thames. Flying the Spitfire is the renowned RAF officer ‘Stapme’ Stapleton, the pilot who famously almost hit Tower Bridge as he pulled away from the skirmish depicted in this scene. ‘Stapme’ later went on to shoot the single German pilot who escaped from an Allied prisoner of war camp, which was later depicted in the classic 1957 film, ‘One That Got Away’. Beautifully painted by artist Nicolas Trudgian. Nicolas Trudgian was born in 1959 and grew up in Plymouth; a vibrant place for a youngster where there was always something to see, be it planes and trains, aircraft carriers and submarines or tanks and helicopters. Nicolas's artistic skill came from his father, a very skilled amateur, who encouraged him to produce the drawings and inevitably, transport and military subjects loomed from each page. The backgrounds to his aviation prints are for many collectors the real attraction, as in many cases his pictures would be satisfying even if the aeroplanes were removed. From the white cliffs of Dover to the sands of North Africa there are endless opportunities for backdrops to his aviation landscapes. Since 1991 Nicolas has lived in the Cotswold Hills in Gloucestershire in a house built in the corner of what was once a Battle of Britain airfield.